Ohhhhhhh yeah, that's the stuff. This was just damn good. The writing was great, the acting was great, even the animation seemed to have more life than usual. 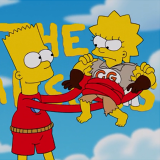 Bart's building resentment and frustration towards Lisa came out in full force and felt very natural to his character, and his eventual career path was foreshadowed throughout the episode with a fair amount of cleverness. Lisa was handled well, too: the writers were careful to make sure she never actually intended to make Bart feel bad or rub her achievements in his face. And hey! For the first time in 20 years, Bart has a future where he isn't a loser! Mostly mixed-to-positive feelings here. Almost everything was actually pretty good (like that things are mostly left to the imagination at the end outside of Bart's job and Lisa&Nelson's relationship) and I'm so happy to notice contradictions with some of the crappier elements of previous Jean era Flashforwards. Quite a few jokes hit home as well and it was nice to see Bart have a decent relationship with Abe. However Lisa was... well... since "Halloween of Horror" and the other S27 episodes to a lesser extent I kinda eased up on Lisa a bit but they really dialed up the "Infallible super genius that's the best at everything" and she came off especially unlikable. But outside of the unbearable Lisa stuff, the rest was pretty great. Spose it's a no-brainer what my favourite scene was. Man, I liked a great deal of this; the way they set up Bart and Lisa's conflict, the way they FIXED so much of the really terrible stuff in some of the previous future episodes (Look, no freaking underwater divorce for Homer and Marge! 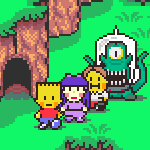 ), the way they let Bart use his passion for BMX extreme biking into something that defines him. A lot of it worked, and you didn't need to see Boyhood to MAKE it work, which is a feat in of itself. Between this and Halloween of Horror, the show might be edging its way slowly back onto the right track. If anything, some of the contradictions were the best parts. Unless Milhouse was hitting on other girls and pretending to have a girlfriend despite Lisa dating him... or unless Lisa's the biggest idiot ever and thought a scumbag that had four kids and ditched them all was perfect boyfriend material... and the no divorce thing, or at least not brought up. On top of that, no Jenda! Was pretty concerned initially that it was going to hit all those notes, especially given the designs used for late teens looked almost exactly like the other instances in Jean-era flashforwards. That and, again, I like how a lot of things were left up to imagination. Lets the viewer draw their own conclusions in a lot of places.